A decade ago, when I picked out our wedding cake, I went with chocolate cake with chocolate frosting. (Because who doesn’t like chocolate, right?) And I was stunned when it prompted the single biggest reaction my mom had during my wedding planning. “BUT A WEDDING CAKE HAS TO BE WHITE,” she said, “HOW ELSE WILL PEOPLE KNOW IT’S A WEDDING CAKE?” In retrospect, possibly this is related to the fact that my mom had a wedding cake so big that it later became famous in Buzzfeed. So maybe she was just devoted to the art of the wedding cake, and who could blame her for that? What Can Bridesmaids Carry Down The Aisle Instead Of Flowers? This year is all about texture, color, handmade elements, and details on cakes. Think dark and moody colored cakes, monochrome cakes, feather-like textures (or hell, real feathers), and hand-painted elements. So we’ve gathered our favorite wedding cake trends for 2019, and we’ve got a little something for everyone—from updates on classic styles to over-the-top modern cakes (and over the top classic cakes), we’ve got it all. Dark and Romantic: Lush and moody has been a winter wedding trend for a while now, but it seems that color palettes are getting a little darker. Black wedding cakes are having a real moment right now. And while, yes, ok they definitely turn your mouth black, they are so damn pretty. Or, you can always go big (big, the biggest) and keep it classic. This huge old school wedding cake happened (because it’s an event, amiright?) at a wedding many of my friends attended. And it was the talk of the town for months. How many wedding cakes can you say that about. (Plus, it reminds me of nothing so much as my parents cake). 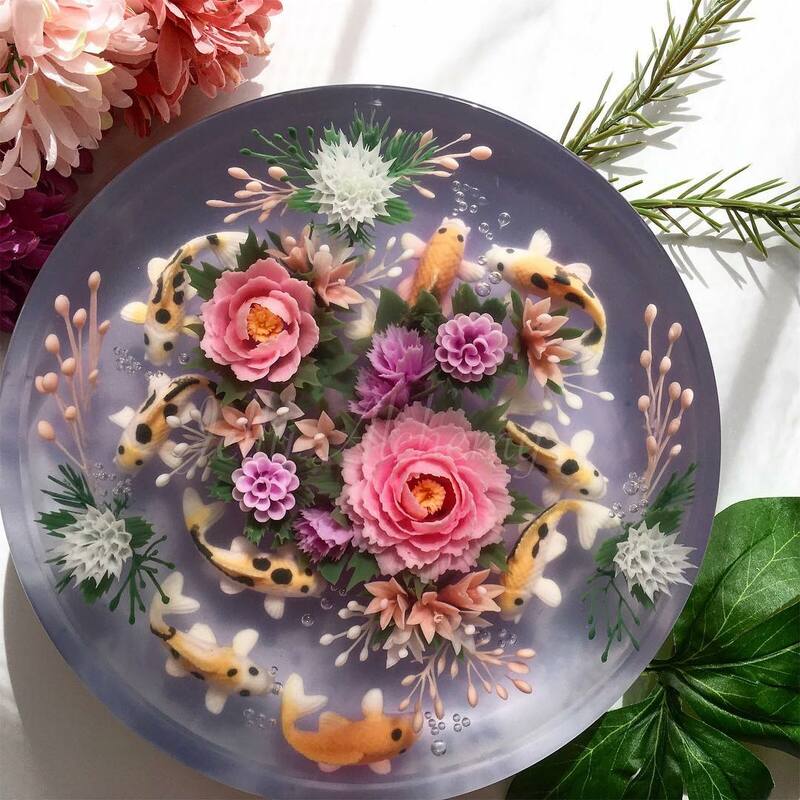 Elaborate Sugar Flowers: Hand-painted cakes have been all the rage the past couple of years, but look out—elaborate sugar flowers are taking over our feed. From watercolor-like flowers to sugar flowers that look like the real thing, keep your eye out for the different varieties that you’re about to see everywhere. Pressed Edible Flowers: If you’re looking to take your wedding cake to the next level and you have a green thumb, try adding edible flowers from your own garden. Instead of just placing the flowers on top of the cake, press them before and decorate away! Printed Cakes: Did this cake make you do a double take too? Wafer paper makes intricate designs come to life like this porcelain tropical-esque pattern. Jelly Cake: Right? WHAT IS THIS EVEN? It’s a gelatin work of art is what it is. With fish. Though fish are obviously optional. Macaron Tower Cake: Ready for the next, thing now that donut wall displays are all over Instagram? (Though don’t get us wrong, we are always here for donuts.) But here, switch out the donuts for another (smaller) sweet treat, macarons. There are so many color combos and flavors to choose from and they make for one epic tiered cake! Tapestry Inspired: Say bye-bye to smooth fondant finished cakes and hello to tapestry-inspired textures. We’re loving this shag rug design from Alana Jones-Mann. The details on this cake are 💯. Geode Cake: While this trend may not be new, it’s still beautiful! Blue agate, amethyst and amber are popular geode cake choices but we love seeing bright pops of crystalized colors, like hot pink too. Bright and Bold: Pastels may be in the spotlight right now, but we’re seriously loving this colorful wedding cake covered in saturated hues. Gravity-Defying: Talk about taking geometric cakes to a whole new level! I know. It’s a little, “BUT HOW DO I CUT THAT”? But isn’t figuring it out half the fun? Color Block: Simple and beautiful never go out of style. Add a pop of color to your wedding cake by making one of the other layers your color of choice instead of a neutral color like white. Cheese Wheel Cake: Okay, so this wedding cake trend might not be new, but it is popular! So much so, that Costco has even hopped on the bandwagon. If you lean more toward savory treats, this cheese wheel cake might be perfect for you. What’s your favorite wedding cake trend you’ve seen so far? What type of cake are you planning on having at your wedding?